In the September 13, 2016 Ask The Headhunter Newsletter, a shy reader frets about networking but is ready to mix it up with new people. I like your advice about networking by hanging out where the people I want to work with hang out. That’s very different from contacting people I don’t know on LinkedIn, which seems creepy and dishonest. But as an introvert I have a hard time breaking the ice even when I’m hanging out with people at a conference, or in a training class or even at a social event. This is for me to get over, but do you have any suggestions? Write it down. And be honest. When I started headhunting, I was fresh out of grad school. I had zero business experience and zero technology experience. But I was recruiting electronics engineers. I had to call people I didn’t know on the phone, introduce myself, and try to recruit them. It wasn’t dishonest, because I had jobs to fill, but talk about creepy! Worse, I was an introvert. I was shy. I hated starting conversations because I never knew what to say. What if someone hung up? My boss gave me a short script to use when I made those calls. I was embarrassed to recite it, but I realized I had to start somewhere. She told me not to worry if I “lost” someone that I called. I read that script to people a few times until I realized it would be less creepy if I tweaked it a bit. So I did. Then I tweaked it some more. After a few more calls, I had re-written the thing so I sounded like me. Still, it was reassuring to read it rather than have to think about what to say. Suddenly I was able to talk to engineers. In behavioral psychology we call that successive approximation of a desired behavior. Little by little, if you approximately perform the behavior of breaking the ice, you feel like you’ve accomplished something — and you get successively better at it. Pretty soon you’re actually doing it. My breakthrough was when I realized engineers appreciate it when you don’t B.S. them. So I started admitting that I didn’t know what rotating memory was — could they please explain it? And, could they please explain to me what’s the difference between a microcomputer and a microprocessor? And that’s the other key: You must be honestly interested in other people and the work they do. If you’re not, don’t even try this. Find another area of work that does honestly interest you, and go talk to people about that. Engineers took me under their wing. Pretty soon I was placing enough of them at better jobs that word got around I was the guy to talk to. I know it’s corny, but I suggest you work up a script you feel okay about. Write it down. Try it out “live.” Pay attention to how people react when you try to break the ice. Tweak it til it feels good. Perhaps it seems corny. It’s not. It’s honest. You’re admitting you don’t know something you’re really interested in, and you’re asking. While someone might be rude and turn away, most people are sensitive to inquiring minds — as long as it’s not a personal topic. Work is open game. All you’re doing is making conversation and getting to know someone. What makes it easy is that you’re letting them do the talking about something almost everyone likes to talk about: themselves. I let go of my shyness when I realized I was fine asking people about their work, and talking about my work — so I stuck to that. Then I became more outgoing because I was no longer afraid of how people would respond to me. Write it down to start. Tweak it — but keep at it. Just remind yourself: If something feels creepy, don’t say it or do it. (See Please! Stop Networking!) Be honest. Talk shop, be yourself, let other people do the talking at first. Pretty soon they’ll be laughing at the honesty of your questions and they’ll tell you what you need to know. Once that happens, they’ll introduce you to their friends. If you’re looking for a new job, that’s where the fun starts! Okay — what magic words do you use to break the ice? Even outgoing folks can get nervous introducing themselves to others. Are you shy and introverted? How do you do it? Should I take a 30% pay cut to keep my job? Dale Carnegie reminded us that to appear as a brilliant conversationalist, we need only let the other person do all the talking. One of my favorites is, “How did you get your start in the [widget] business?” or anything else that leads them to recount the history of how they triumphed over adversity to be the shining success they are today. Other questions, similar to Nick’s above, are about what changes they believe are really needed to improve the [widget] business. Unless I’m at an event SPECIFICALLY for job seekers, this is a great opening. It’s friendly, neutral, inquisitive, and gets people talking. Last week I did a pro bono presentation for the local YMCA – a career group. I asked them, what are you all doing here, trying to find a job among other unemployed people? Why aren’t you at professional meetings where accountants, engineers, marketers, IT folks gather? Why do you expect other job seekers to help you land a job? I know, I know – someone might blow an interview and tip you off to an opportunity. I still don’t get it. I think this applies to both people looking to hire as well. Sheesh. Is it any wonder employers need software to sort all those applicants? If they were to look in the right places, they’d have less drek to process and more hits. HR really believes that it can find a needle in the haystack. HR is now in the haystack building business. Been there done that and that was BC (before computers) IT WORKS, landed me a number of interviews, jobs, consulting contracts. Here’s a tip I often use. You won’t see this as often at conferences, more in daily life. But networking happens all day, every day, right? The initial question usually gets a smile because they don’t expect to be asked something like that. Or at least not in that way. This is a palm to the head moment. I’m an off the charts Myers-Briggs “I” with all that comes with it. I really hate calling strangers, or even people I don’t know well on the phone. In order to get through it I script my first few sentences. I don’t know why I haven’t thought to do it for face-to-face meetings or meet and greets. I’ll try that. Thanks. Then there are those who want to know the background of how it works, why it works, and maybe learn there’s a better way or a different way, or even–this is totally crazy–that what you’re told isn’t even the truth? Most people today have already stopped reading me because I’m using too many words, and if it’s not on Twitter or You-Tube–they don’t want to read. if you’re like that, good luck with learning anything new. If this offends you, then your backbone needs some muscle as I find people get offended by words, yet look the other way as other people in the world have their entire lives bombed to bits–under the guise of “economics”. Like Nick, many moons ago I didn’t know how to communicate with people. However, besides getting books on all that, I actually started studying psychology and NLP–because I wanted to understand how the mind works! If you’re not interested in how the mind works, then you’re just looking for the answer, and the shortcut. Shortcuts are helpful but if you don’t know yourself–that will hurt you in life. An analogy is asking Bruce Lee to show you how to do one punch or kick, but not knowing his system, which in his case, was a combination of systems akin to Tracy’s Kenpo. There is no shortcut to kenpo. NLP is the best framework there is to understand how language programs the mind via instructions, and how language composes beliefs and value hierarchies. ***The best communicators use NLP. In closing, Nick said something lethally important: be authentic as in if you don’t mean what you say–don’t say it. Mean what you say and say what you mean. However, that can also get you fired and killed in today’s BS workplace, so you need to know psychology & NLP. It’s a world of BS and sharks. Would you walk up to Bruce Lee and complain the bully beat you up again–and get mad at Bruce Lee when he asked what training you had in martial arts? If the answer is yes, then you just don’t get it. No, it doesn’t. The more you know, the more you can fiddle and tweak, and the more you get out of a thing. Understanding how language and the mind work is the same thing. Study it. Learn how to use it. Read the manual. And don’t buy stuff that doesn’t come with a manual. LEARN HOW TO FOOL AROUND WITH IT! “Don’t buy anything that doesn’t come with a manual”. “Fool around with it”. My refrigerator just works. I don’t know how to tweak anything in it. Same for my stove, my car, etc. Heck, my house has wiring and plumbing. It just works, until I need to call a tech in to fix something. Is there any reason that my calculator should need me poking around on the inside? Make that calculator better, stronger, faster — give it graphing abilities. I can still stay out. Or how about my phone? I can stay out. Make my phone bigger and smarter, and merge it with my graphical calculator? My typewriter just worked. There were graphical typewriters that let you edit text before it hit paper. Then came stand-alone word processors. Combine a word process, an advanced phone, and an advanced calculator, and what do you have? And why should you insist on being able to tinker with the insides? If there is a problem, it is not that “It just works” was sold to consumers. It was that “It just works” had not yet arrived. Today? We are seeing more and more than spread of walled gardens, where only small numbers of approved apps can run, on Kindles, on Phones, on Computers, etc. And as the amount of end-user customization goes down, the need for end users to fix things goes down. At some point, the computer will just be another appliance, that just works. Keybounce: Good response. But I still believe stuff I can mess with is better than stuff I can’t. Including plumbing, wiring, anything that can be configured and doesn’t just work one way. Maybe I’d never mess with a fridge – but actually I have. And anything programmable – I want to be able to change it, fix it, get inside it. I respect that you don’t. You want stuff to just work. In any case, I think Jobs screwed up a whole lot of people by convincing them what’s cool is to use his products, not to really understand them. I want manuals. I want the lid to come off. I never liked potted electronics. I’ve made many, many changes to the configurations of systems over the years. Frankly, I cannot understand the idea of companies that vendor-supplied stuff, and user-supplied stuff should live in the same location. Back in OS X 10.7, I made certain that there was a clean, perfect separation. This broke several things from Apple that assumed otherwise. My home directory was in /Volumes/UserData/users/Michael, etc. The idea that /var/folders/xxxxxx had various stuff, including per-user temp dirs, cache dirs, etc, was a pain, because that was on root, and root was sized just big enough to hold Apple’s distribution. /Applications was Apple’s apps, not mine. Etc. Fast forward to a new computer, and 10.9: Now, during very early boot, before any configs or scripts you’ve written are checked, the boot code wants to make sure that /var, /var/folders, /Users, and a few others, are physical directories (not symlinks) on the root drive. If the root drive is partitioned — same “platters” — you can’t have a link there. I can understand not wanting a link to an external drive that might not be there. But an internal partition? Suffice to say that I seriously considered getting the source for the startup code (it’s public source on Apple’s site), and modifying it. I decided against it only because I thought it would make maintenance just a little bit too hard. The result? Only about 75% of “my stuff” is on a second partition. If I do have to restore my root from time machine (once in the last two years), then some of my personal stuff comes with it, and the restore is a bit larger and slower than I’d like. I broke it. I know how to maintain it. I know what I can and cannot do. I’m also not going any higher than 10.9.5. In each of the later versions, the sandbox gets tighter and tighter. This means it is harder for malicious stuff to get away with altering the computer; it’s also harder for me to do things that make sense. As it is, many things in the 10.9.5 sandbox do limit things to /Users/username/, and do not permit a symbolic link outside of that. So, I’ve had to leave a number of things on the root drive. Yes, it took a lot of trial and error to find out what does/does not work. I’ve had to stop using some programs because (as a result of bug fixes and security holes), they now generate massive temp files on the root drive every operation, and my root isn’t that big. It’s not that I don’t want to get inside things. It’s that I don’t believe that 20+ years of computer science should be needed to make use of a combination word processor / fancy calculator / WWW terminal / game player. And I don’t have the years of experience to get inside a car. I’m not going to retune a car for performance, etc. — I’ll take what the vendor supplies unchanged. Ditto for all my other “just works” appliances. Keybounce: I learned to program on a TRS-80 Model 1. No hard disc. No floppy drive. A cassette recorder. Graduated to a stringy-floppy from a company called Exatron. Think very thin tape in a long loop. Anyway: Perhaps it’s not that I insist on being able to get inside of things and to be able to fix them. Maybe it’s more that I like learning the ins and outs of how a product I’m using works. I think suggesting that something “just works” and “you don’t need to learn anything because it’s user friendly” promotes bad habits. @Nick, Yeah, it is a tangent, albeit a fun one. I think you’ve got it backwards: I don’t fiddle inside my calculator because changing anything will almost certainly give it a (worse) case of “dunverk”. It’s not that it “just works”, but when it doesn’t work, there truly are “no user-serviceable parts inside”. I’m a software engineer with almost no electronic or mechanical skills. Nonetheless, I’ve repaired both my clothes washer and dryer is the last few months. In the last two years, I’ve modified household plumbing and wiring, repaired my furnace, dishwasher, and car. Not knowing how something works means that you cannot reason out the limits of a system’s capability. You could end up trying to use your clothes washer to clean stemware or trusting your self-driving car to actually do all of the driving. Choosing to not understand the system is an abdication of responsibility. Not knowing how things work leaves you either slavishly dependent on a nanny state/market or overconsuming in a needlessly segmented market. So, do I have buy both a pressure washer and a paint sprayer? They both take in liquids at low-pressure and produce a high-pressure spray… why do I have to pay for the same thing twice? Duh! Because the pressure washer is designed to produce a spray that bounces off the target while the paint sprayer is designed to produce a spray that adheres to the target. You can never know too much, but it’s vital to understand the limits of your knowledge. Say! Gasoline and naptha are both petroleum distillates, so I can use gasoline in my Zippo, right? I learned to program in 16K of RAM. Graduated to 64K on an IBM PC. Wrote a huge program in BASIC that crashed after I entered 4 records. That’s when I learned the difference between the code segment and the data segment, and that the BASIC interpreter was data taking up room my program (more data) needed. My real learning came while I fixed the problem by inventing my own version of modular code :-). I think this is a tangent. Where was this column 30 years ago? I think all of us dread that time the conversation just dies and new topic doesn’t pop up on its own. If you reach that point, a good-in-just-about-any-situation conversation starter is: “Have you had a chance to get a vacation in lately?” or “Planning any get-aways?” and usually leads to a lively discussion of interests and preferences and sometimes even useful information to apply in the future. If you find something in common it can provide a reason to connect later. “You go to Cape Cod every summer? Could I call later to get the names of places to stay that you recommend?” (But don’t fake it.) And just having a question in your back pocket can give one more confidence to reach out and talk to others. If you’re scouting for potential employers, questions like “What’s your favorite thing about working at ABC? “How has your job changed since you first got hired?” “How’s business changed compared to last year?” “What speciality has the longest backlog & why?” etc. are all likely to lead to good discussions and insights. This is a masterful job of making a rare but essential skill available to everyone who can read. When these ideas first appeared several years ago, they were generalities. Now they’re detailed steps and sample dialog. I used Nick’s strategy 50 years ago to change careers successfully. It’s not new – it’s in the Bible, in the story of John the Baptist and the fishermen Andrew and Simon Peter. And how they took the first steps that ended with sainthood and a new direction for history. So if Nick’s strategy sounds familiar, maybe this is why. BTW if Nick is interested in a doctorate, I have a dissertation topic for him. I didn’t find it until last year, when I turned 78. A small token of my appreciation for his work in pushing job search forward. Tom: Thanks. So tell us the story of John the Baptist and how it applies? Seems to me you’re not pitching religion, but ideas, and I’d love to hear the idea. As for a dissertation, I stopped my education just short of that. Tell us about that, too, or drop me an e-mail. So, what we see here are examples of recommendations and invitations to friends, along with invitations to strangers to come and see for themselves. No high-pressure tactics. Just sharing of good news among friends and acquaintances–examples of networking in action. I’m another 10th degree black belt introvert who turned myself into a recruiter. In short let’s say it was a character building exercise, particularly picking up the phone and cold calling a stranger. I pretty much transitioned the way Nick said, a script, which became my script, which became no script. If you keep in mind a couple of things if you struggle with this sort of thing you’ll find you can do it too. 1) It’s an acquired skill and 2) Most people want to help. I also employed honesty in light of a lot of BS in the recruiting world about how to get around gate keepers by being really clever and devious. My opening usually was “I confess I’m a recruiter” and 2nd I worked the IT/Engineering world in which I worked for 25 years before I became a recruiter, so I’d send potential hiring managers & applicants my resume which I found almost no recruiter did. The interesting thing about networking discussions is that what almost comes to everyone’s mind and strikes terror in the heart of introverts is the automatic inference that you’re talking about “working a room” Which I loathed to do and still do. The good news is we live in a virtual world. The internet is a great tool for introverts. So if you do intend to go to an event and work the room, you can back up and look for and reach out to people who may or better, will be there and make some contact before you walk in the door. The script concept is still there for you to use, but you can develop an email, twitter, whatever your choice script to try & break the ice. If you make a few hits you can then walk in, and focus on starting out by talking to someone who you’ve already “met”. The introvert willies won’t just disappear. So for calls and face/faces prime the pump. That is start out by calling someone you know and will take your call, and/or someone who know is going to the event. Drag your introverted self out of the shell and start talking comfortably. You may also consider digging into who’s sponsoring these events and offering to help. There’s always something needed to be done and most cases the help is appreciated. If you know your stuff volunteer to speak. Now you’re not just hanging on the fringes, you’re part of the event. You can add me, another off the MBTI “I” chart, to your list. Introvert doesn’t mean “shy”, it is the difference in how you get (re) energized. I need downtime, by myself, and peace and quiet while an extrovert is the life of the party and gets (re) energized by interacting with people. I had often worked in jobs that were the behind the scenes kinds of jobs (cataloguer in libraries, doing research/office management work for a small law firm, non-sales insurance, etc.) that suited my introvert personality just fine. Then my last job was much more out front, dealing with people, and not just face to face but I ran an online master’s program. At first it was hard, but I did what Nick suggests in this week’s Q&A–anticipated what people would ask me when called and wrote a basic script, which I constantly tweaked as I learned the ins and outs of the program and got comfortable talking (and email corresponding) with all kinds of people. Later, I didn’t need a script. I would add to Nick’s excellent advice re starting with a basic script that you can tweak, to practice speaking, and, to add a trick I’d learned from the lawyers (depending upon the case), ask open-ended questions (vs. yes-no questions) and keep it light/easy/relaxed. Don’t take offense if the person you ask isn’t very conversational–you might have asked someone who was shy, tired, etc. and didn’t feel like talking. But I’ve learned that many people like to talk about themselves, including what they do for a living (especially if they’re passionate about it). “What you like the most about being an engineer?” vs. “Do you like working for XYZ Corp.?” You might get more out of the former question than the latter (which can be answered with a “no” and that’s the end of the conversation). Don’t be afraid to spend more time listening (you have two ears and one mouth) than talking, but I always try to ask open-ended follow up questions too. But if someone just isn’t into it, then I let it go and don’t take it personally. Try someone else. After I lost my job I heard about this thing called ‘networking.’ I never did that before, and the very idea of walking up to someone I never met and saying hello was crazy to me. 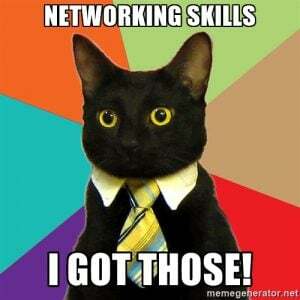 But I knew I had to do it, so I read dozens of blog posts about networking. Two problems with this: 1) Every time I opened my mouth I sounded like those blog posts; and 2) Everyone I spoke with sounded like they had read the same blogs. This was getting me nowhere. I believe that people hire people whom they like, or with whom they feel comfortable. I think that’s at least as important as what you know about a job, because if you’re the right person you will learn what you’re lacking and keep learning throughout your career. That’s got to be better than the elevator speeches and prepared talking points that my competition is busy rehearsing. At least, I hope it is. There are no “magic” words involved to break-the-ice that I use. It’s a matter of the where, who and what is going on. Walking up “cold” with planned openers (sound-bites) can be like blasting resumes to HR – hello “file 13”! Yep, that about sums it up. “B.S.” flows ad nauseam when one networks because the have to, such as they just lost their job. True networking begins well before you even sense the need to move on. Very true and time tested avenue to create cracks in the ice. I was curious to read about this subject because I at one point felt I was extremely shy. Yet I also knew there were moments in my life that I wasn’t. I couldn’t stop talking. I researched quite a bit on the subject of shyness, read many books on overcoming it within the self-help section. I was really stunned when one book helped me discover that many of us aren’t 100% shy. We’ve always got a few subjects that we can really talk about fluently. It’s mostly a matter of developing confidence, to combat that fear of looking or sounding stupid. I’ve found it useful to connect the subject of a meeting with 2 or 3 favorite personal interests in order to have something to talk about more smoothly. Some common interests make this easier such as sports and music, subjects that many can relate to. If necessary, those are available to keep the talk going and get others input for them to expand upon too. However, I ended up loving another TRS-80 even more, the TRS-80 Color Computer. Devotees affectionately called it CoCo. In terms of holding conversations, however, I don’t want to engage in too much disassembly. One thing we definitely want to avoid is sound scripted.